Habitat for Humanity Manitoba raised the first wall to a new home being built in Memorial Park on Monday. Habit is celebrating its 25th anniversary and will construct the home in the downtown Winnipeg park, which is celebrating its 75th anniversary. 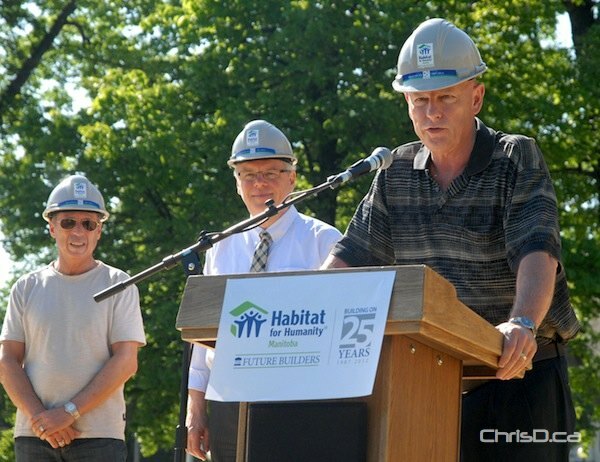 Premier Greg Selinger and Mayor Sam Katz were on hand for the morning wall-raising, along with a handful of Habitat volunteers. The home is being built primarily by volunteers who have donated to the Habitat Builds online campaign which concludes on June 15 with donations continuing to be accepted until June 20. The first-time homeowners will assist in the construction of their home, working side by side with other volunteers under the direction of Habitat construction crews.